Life along the Ligurian Coast hasn't changed much. Over the centuries through present day, small groups of people have gathered around a natural harbor and terraced hillsides suited for growing grapes and olives. Due to the steep hills separating the coastal hamlets from the rest of the world, life here moves at a more relaxed pace. The locals fished, farmed and traded with the other close by towns. They had enough to live and more than enough natural beauty to enjoy. Around the late 19th century, the discovery of nearby Portofino by English aristocrats gave birth to "The Italian Riviera." The secret was out so the rich and famous decided to invade this stretch of coastline. Over time, tourism became more lucrative than fishing or farming for the Ligurians. The 5 towns, train pass, and a ticket for pesto class! The Cinque Terre (5 lands) are located 85 km down the coast from Portofino. Today, the villages with their small harbors, quaint cobbled squares, gift shops as well as restaurants and bars are interlinked by cliff-top trails. Each of the 5 towns has a unique mix of history, pristine beaches, panoramic views and vibrantly colored villas. The trails linking the Cinque Terre differ in difficulty and length. Hikers traverse along the cliff paths and occasionally pause to soak in the incredible panoramic drama of sea and cliffs. 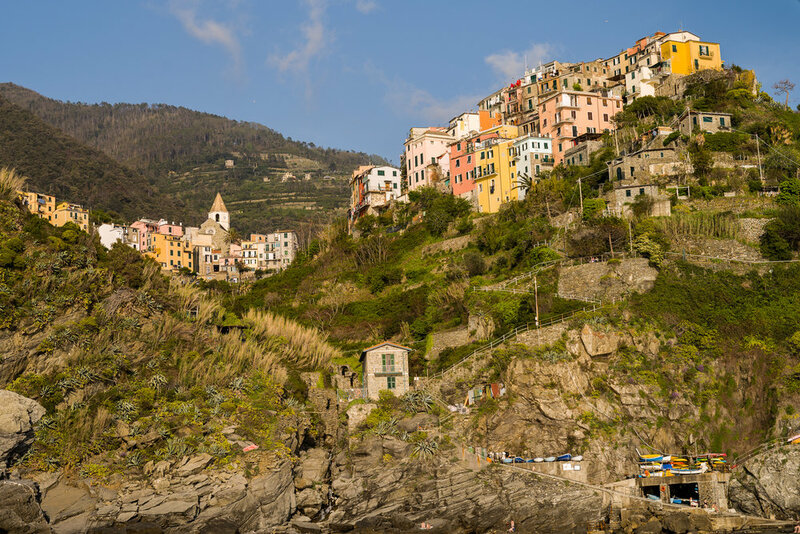 And if hiking the sometimes dizzying paths of the Cinque Terre coastline isn't on your itinerary, simply board the train that goes back and forth through the tunnelled cliffs and makes a brief stop at each village many times each day. What makes Cinque Terre Unique? This rugged region is a celebration of the outdoor lifestyle, picturesque fishing villages, secret beaches and an enhanting hinterland. Protected by the Alps, the Cinque Terre is perched on a crescent-shaped sliver of coast. During the high season the weather is sunny and balmy but storms visit during the winter. Cinque Terre is simply extraordinary and in order to understand it, you must visit. Our Levanto host, Paula, explains what makes the area unique. "The Cinque Terre is one of those places people tend to read about once and then dream about forever. An isolated part of the northwestern Italian region of Liguria, the Cinque Terre is a beautiful stretch of coastline inset with five tiny villages perched between the Mediterranean and a range of steep coastal hills. The aura of romance about the place is enhanced by the very names of the five villages: Monterosso, Vernazza, Corniglia, Manarola, and Riomaggiore." All along the steep Italian coastline, you find small villages surrounded by vineyards and olive trees. Many of these villages were also once connected by only foot and donkey paths. All but Cinque Terre have succumbed to the automobile. Only Cinque Terre retains the charm of an automobile free environment. Where else in Europe can you find 5 villages with a total population of 6,000 people connected by small boats, rail and trail? While not completely free of automobiles (the 5 villages have roads TO them) these villages retain a major component of that idyllic past lifestyle that we moderns crave. Another unique quality of geography is the Cinque Terre harbors are too small for cruise ships. Unlike Portofino or Santa Margarita, big ships simply don't fit. Instead, the large ships harbor at La Spezia. Some cruise tourists board the train at La Spezia in order to spend a day in Cinque Terre. However, this requires time and effort so many cruisers tend to bypass the area. Make no mistake, cruise tourists visit but it is not as high density as other more easily accessible locations. In Italy, food is life. The world knows and loves Italian food. But Cinque Terre takes food to another level. Fresh produce, baked goods and local seafood abound. There are restaurants with Michelin stars. If you are looking for a special dinner, reserve an outside table at Rio Bistrot ( 2 stars) in Riomaggiore. The food, the experience and the view of the harbor from the terrace makes for an unforgettable evening. But you don't need to spend lots of money to have a great meal. Fish lovers can find the "catch of the day" in many restaurants and pizza or focaccia are sold at many pop up shops. Sit outside while you eat and watch the world go by. 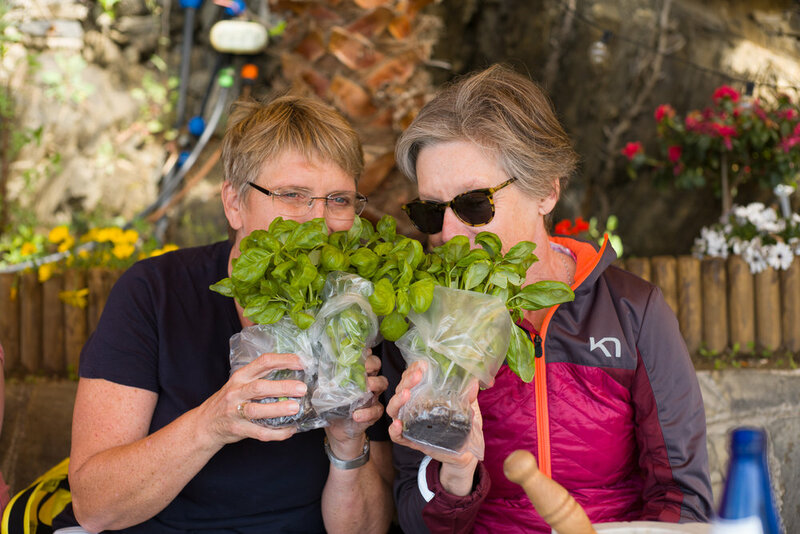 For a hands on culinary experience visit Nessun Dorma and make pesto on their spectacular terrace overlooking the Manarola harbor. And, after working so hard to master pesto, celebrate with lunch. Students mash fresh ingredients (basil, pine nuts, garlic, Parmigiano Reggiano, Pecorino Romano and olive oil) with a mortar and pestle. Our instructor explained the theory of good pesto and gave practical instructions. Learning to make great pesto is easy if you have the right ingredients and the prep time. Cinque Terre is best viewed from the water and you have many opportunities to get on a boat. During the high season, a public ferry system travels from Levanto to La Spezia stopping at each of the 5 villages in between. These ferries are small and popular so arrive early enough to get a spot. You can also rent a boat or take a private boat tour. Do you want to be the captain of your craft or have an experienced skipper who knows these waters while you enjoy the view? Cruising into one of the small Cinque Terre harbors with Angelo from Villa Valentina is a treat! He knows all the local fishermen and takes the time greet each one and discuss the weather conditions. Angelo grew up in Monterosso and navigated his first boat at the age of 12. From the water the town's tall buildings look old and fragile in the midst of the towering hillsides. From this perspective it is clear there is no major infrastructure to handle the hordes that cruise ships would bring. Just 5 small villages hugging the coast. Capitano Angelo of Villa Valentina navigated an unforgettable afternoon/evening cruise while our small group relaxed, enjoyed Prosecco and photographed a magnificent sunset. Because Angelo is a 10th generation fisherman from Monterosso, he has access to boat docks that are not available to tourists in addition to knowing how to safely navigate along the rocky coastline. A 2 or 3 hour boat ride provides an alternate way to experience Cinque Terre . After dinner, after many tourists return to their lodging or take the train back to their cruise ship, these little villages turn back the clock and become themselves. After our wonderful dinner at Rio Bistrot in Manarola, we explored the narrow streets and terraces. We came upon a group of kids playing soccer in the square under the lights. We walked past lovers at cafes. We took in the stars in the sky above the harbor and buildings. The town was quiet and tranquil. Treat yourself to a walk through a village after the crowds have departed and you will get a sense of how the locals live. One of the most memorable days involved a Vespa and simply driving a few miles into the hills above Cinque Terre and Levanto and experiencing a different side of Italy. The hill towns are quite small with only 1 or 2 cafes or restaurants for the locals. Most people we encountered didn't speak English but were thrilled for our visit and took pride in what they have to offer. Life in these little villages is even slower. The roads are windy, lightly traveled, narrow and scenic. The food is simple and healthy. We wish we could tell you where we went, but honestly, we dont know. We just followed our front wheel and stopped along the way when we found something interesting to see. With a small motor Vespa you do not need a special license. There is a simple throttle with an automatic transmission. Anyone can easily figure out how to drive one quickly. Get on a Vespa and have an adventure in the hills. For centuries the narrow and scenic trails connected Cinque Terre. And today, the trails are still one of the best ways to enjoy this area. The lands surrounding Cinque Terre are a National Park. You must pay an entrance fee to hike these trails. Rangers are stationed at the entrance and check each hiker as they enter the trails. The Cinque Terre card allows access to the hiking trails and to the trains. You purchase the Cinque Terre card at any of the train stations. Decide what you need and buy the card as it will enhance your experience. Travelers from around the world hike these trails and you will hear many different languages as you make your way. The trails go between all 5 villages and into the hills above. You can also start in Levanto and hike to Monterosso. Along the trails you may find little rest stops and restaurants so you can take a little break with a breathtaking view. One fond memory was of a farmer selling fresh squeezed lemonade and limoncello from a small shack on his lemon orchard which was right next to the trail. We started with lemonade and ended up enjoying a glass of limoncello with him. The trails vary in difficulty. Pack a hat, sunscreen, water, snacks and perhaps a sturdy hiking stick as there is a fair amount of elevation gain between the villages. For a more detail about hiking in Cinque Terre we recommend Michael Turtle's Hiking Guide. 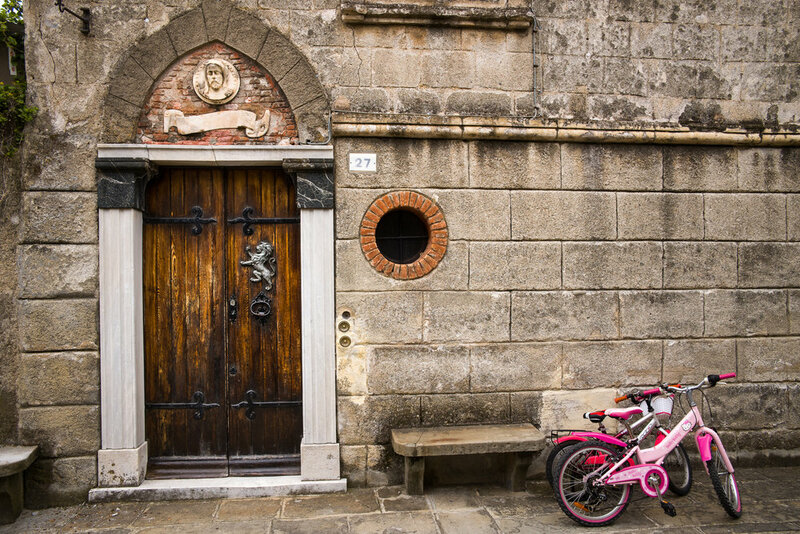 One day we hopped on Villa Valentina bikes and rode to Bonassola and Framura. The old rails have been converted to a nice bike path with tunnels through the hills. This paved path overlooks the sea. The ride is about 5 km and is flat. At various points along the way, you can stop and marvel at the outrageous views and enjoy a coffee or lunch. Bonassola is like Levanto but is a smaller, quiet village on the sea with a wide sandy beach with chairs and sun-shade umbrellas. There are a few cafes. There are children happily playing. And there are not too many tourists. Framura is a small fishing village with charming narrow steep streets winding through stone buildings. There are even fewer tourists in Framura than in Bonassola. Finding the right Cinque Terre accommodation is a challenge because these charming towns are small. Fortunately you won't find any chains like Hilton or Marriot. However, most of the boutique hotels are quite pricey and hostel type lodging while inexpensive, is likely noisy and bare bones. Tip - Unless you are paying top dollar for a bellman to meet you at the train station or harbor, you will carry your luggage (hills are steep and not a taxi to be found). We wanted to stay someplace that would not break the bank and fortunately discovered Villa Valentina in Levanto. And are so happy we did! 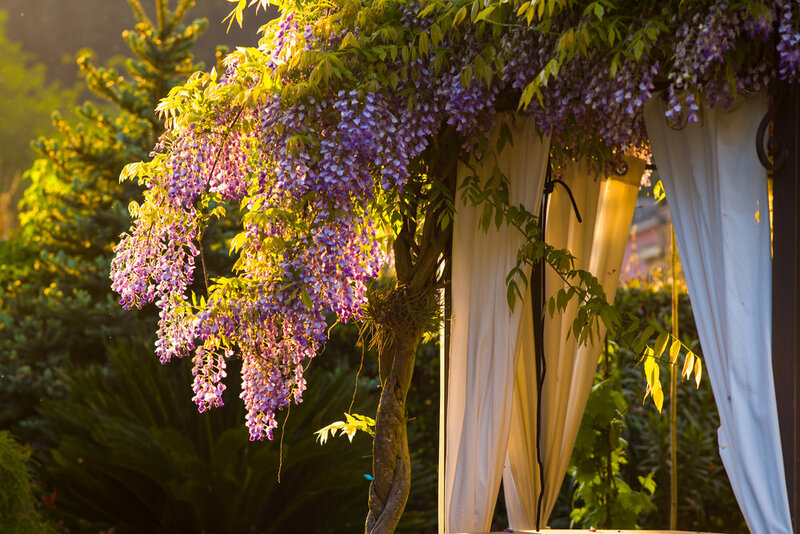 Villa Valentina is owned and operated by California expat, Paula and her Italian husband, Angelo. From the moment Paula greeted us at the Levanto train station to our last evening's event - a Pizza and Aperol Spritz garden party - we were family. Every morning began with sumptuous breakfasts includeding freshly baked bread, fresh eggs "your way" and even spontaneous Italian lessons! Paula would check in about our plans for the day, offer suggestions and answer questions. How about a sunset boat trip, pesto class, best place for lunch or dinner, hiking suggestions, vespa rental, bike to town, reservations? And, if you want to simply lounge in the garden and read a book, there is shade under the trees to keep you comfortable. We highly recommend Villa Valentina. The Villa Valentina crew is warm and helpful. Just tell them what you want to do and it will happen. Levanto or "The Little Sister" is a doorway to the Cinque Terre. It is a beautiful seaside town and sometimes called the sixth sister of the Cinque Terre and is only 1 train stop (5 minute ride) from Monterosso. Tip - You can also hike or boat to Monterosso. The views along this section of trail are spectacular and the path likely less traveled. This town makes a perfect home base. Levanto also has a long sandy beach, a diving center, an interesting old center, colorful villas, a bustling Wednesday market as well as excellent restaurants and shops. At the port you can rent motorboats, kayaks and surf boards. In fact Levanto is a well known surfing spot with some of Italy's biggest waves and has become the undisputed surfing destination in northern Italy. Driving and parking in Levanto is easy and it is close to main airports. Day trips to Genoa, Pisa, Lucca and Florence are not far away. During our stay in Levanto we met Gina who brings vintage design to the new world. For those of you excited about thrifting in Italy look no further. Modern Thrifter in the Old World turns looking for vintage clothes and furnishings into a treasure hunt! Join American/Italian Gina Pagnella as she romps through the countryside discovering "markets and artisanal boutiques that preserve relics of hand-made quality craftsmanship and timeless style, making them accessible to the world so you can help me keep them alive!" We love Levanto and Villa Valentina. 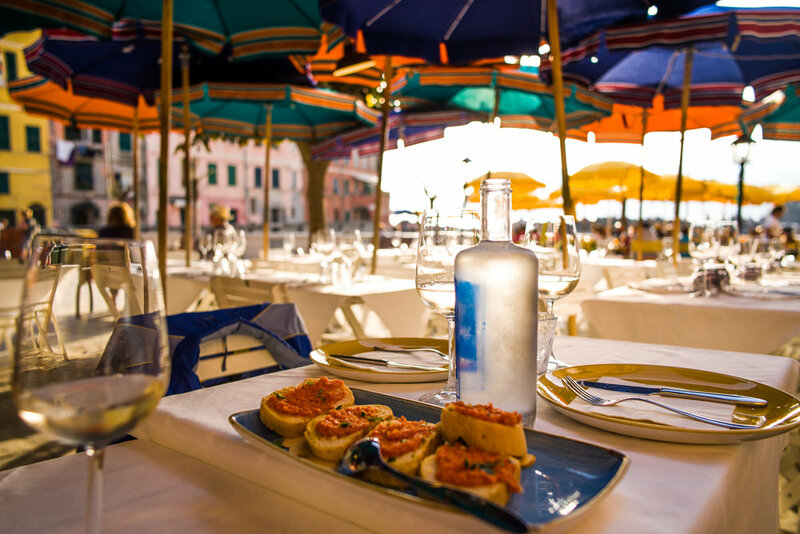 We highly recommend both as the best way to enjoy Cinque Terre. With dramatic hills and the Mediterranean Sea in the background, Cinque Terre and Levanto provide an opportunity to enjoy life at a slower pace. Calm waves lap the shore, children play in the water while young men and women lounge on large blankets in the sand. The local food, drink and hospitality add to the experience. Expect Cinque Terre to be full of tourists as it is a beautiful, unique and an attractive destination. However, if you plan ahead and visit a little before or after the peak season, you can avoid the crowds and enjoy the tranquility. If you decide to stay at Villa Valentina, please give our best to Paula and Angelo!! We hope you enjoy the images in our gallery. Below is a sample. We hope you are enjoying the articles and photographs on Travel is Beautiful.